Looking at the major segments of the trade market, e-book sales were up 13.6 percent in the adult segment, down 30.1 percent in the children’s segment, and down 0.6 percent in the religious segment. The children’s segment accounted for a big part of e-book growth last year, thanks in large measure to the Hunger Games franchise, but that boost has proved temporary. E-books are still taking share from printed books, as overall trade sales declined by 4.7 percent in the quarter, but the anemic growth of the electronic market calls into question the strength of the so-called “digital revolution” in the book business. E-books now represent a bit less than 25 percent of total book sales. That’s an impressive share, but it’s still a long way from dominance. Other big e-book markets also show signs of maturing. A new Nielsen Research report indicates that UK e-book sales actually declined slightly in April from year-earlier levels. Those still seem reasonable. Most intriguing, to me, is the possible link between the decline in dedicated e-readers (as multitasking tablets take over) and the softening of e-book sales. Are tablets less conducive to book buying and reading than e-readers were? UPDATE 2: The original version of this post described the Nielsen data as being worldwide; it actually reflects only the UK market. *Sources of AAP data in chart: 2009 2010 2011 2012 2013. The AAP doesn’t seem to release its sales reports directly to the public, so collecting the data, from secondary sources, is a bit of a trial. In general, good information on book sales is hard to come by. This entry was posted in Uncategorized on August 5, 2013 by Nick. And–Advertising drives sales. The device wars promoted e-books incidentally. Wars, gone. Promotion, gone. Sales going down to natural levels. I think the core difference between the types of books that work well vs. don’t work well on e-readers comes down to whether the original content is based on reflowable text or not. Fixed layout books, like most text books, do not work well on e-readers. This is a technical problem with the content source that will change with time. The navigation/search usability issues should change over time too. I think there is a bit too much emphasis on a single reading experience winning when a multiple device/formats will probably be the norm, even for a single reader. Ideally, every textbook should come with the ability to download the associated e-book (hopefully with reflowable text and e-reader friendly images/charts). Many software oriented books do this now (e.g. Manning Publications). I would say that tablets are less conducive to buying ebooks because, as you suggest in the post, when you’re on your tablet, THERE’S A LOT OF GOOD INTERNET TO DISTRACT YOU. It’s the same problem as when I have to decide between picking up a paperback or clicking through blogs on my MacBook — except that with a tablet, the book can actually become blogs, with just a few touches. I have read a couple of books on an e-ink reader and found the experience quite enjoyable (for linear reading of pulp fiction anyway). I have attempted to read books on an iPad 3 which I otherwise love, and found the experience intolerable. So I’m inclined to think that the tablet migration definitely had some effect. Once we have fast color displays that are readable in natural light, e-book sales are likely to accelerate again. What about Piracy? Pirated e-books can be found quite easily today. This also just looks at percentage growth rather than market share. In reality, things can only continue to grow for so long. For the most part, the explosive growth hit when e-readers and tablets first hit the market. Now that we’re seeing market stabilization around the tablet market, we’re seeing a stabilization of growth. The real numbers to watch at this point are market share over the next five years to see where things will really go. In my opinion you should only buy a book once and get all formats for the one price. A printed book should come with the ebook and audio book as a package and they should be as integrated as possible. I always seem to pay for a book on audible and end up buying the paper book to refer to. They should not be separate. A licence to the electronic versions should come free with a paper book. When I read a paper book in bed I should be able to use a special bookmark that synchronises the furthest point read with my ebook and audio book version. When I get in my car and listen to the audiobook version it should start from the same place and again sync so when I get out and pick up the ebook it is in the right place too. If I notice and interesting passage and book mark it in the audio book to look at in more detail later I should be able to go to my ebook and that passage be marked automatically. At the moment I tend to buy audio books and second hand paper backs. Ebooks for my kindle are just not good value. The fiction/nonfiction split is something I’ve noticed again and again, and now shop mindfully of. I need to flip through and go back often in nonfiction, and e-readers simply aren’t good at that. If I know that a section or passage is in a general area of the book, but am not sure quite where, it’s a pain. Pricing is also an issue. If I’m paying the same price as a paperback, then I want the paperback, which I can then lend out if I want. I also bought a Kindle Fire this year, and was really disturbed by all the features that were unchangeable. No choosing my own background? Extra fees to avoid built in advertisements? Lots of apps not available? It makes me wary of “owning” too many e-books, whereas I’m quite certain I own my paper and hardbacks. The comments above while intriguing suggest that the users of tablets do not know how to use the e-reader apps provided. The beauty of an ebook is its internal bookmark, the fact that you can highlight passages (and forward them with ease.) You don’t need to flip the pages, you just hit the index and find the chapter you were looking for, and if it was important enough to you, you will have already highlighted the passage you wanted. The additional plus is space. Ebooks don’t collect dust, or have to be packed in boxes when it is time to move. Nor do they disappear when an ereader dies. In time only the very rich will be able to afford libraries because the space simply won’t be there unless we want to gobble up the remaining green spaces that give us clean air. Ebooks are here to stay, no matter what the naysayers say. There’s just too much waste in print format, and we are talking about killing multitudes of trees in order for someone to read a book they decide they don’t want to keep. None of the previous comments suggest anything like that, and your comment does not address the actual complaints at all. “Killing trees” is a silly red herring. Only a tiny fraction of global lumber production is used for books, the paper can be recycled, and the trees grow back. The last part is especially easy since paper doesn’t need wood of some special age and quality like furniture or structural timber does. You can even make it from other plants! Amazon stuffed the market with its KDP scheme putting eBook downloads into overdrive. People became satiated with eBooks, most of which were rubbish. Now the e-reading public are a little more discerning, and those who jumped on the free book bandwagon have more than enough books in the e-store. You guys and gals must all be very young. For me the best thing about reading e-books, whatever the platform, is that I can increase the size of the font. Many paper books are now beyond my reading capacity in poor light. I don’t know what percentage of the population need reading glasses but it must be quite high. I do agree with the comments about reference books – I prefer paper. I absolutely agree with the last reason: price. For myself, if I can get a used paperback from Amazon or even a new one for less I will take that option over downloading it on my Kindle for more money. Most of us have a tight budget for things like this, unfortunately and I can’t afford to participate in publisher’s inflated ebook prices hissy fits. I love my Kindle, I love that I don’t have to pay shipping costs but I can’t justify spending more just for the convenience. I know some publishers have overpriced Kindle offerings–on par with hardback prices–just to discourage ebook sales. Hi, Nick. As a publisher, I have an intense interest in this topic. My own experience has been that ebook sales growth is flat over the past several quarters, but what really fascinates me is that ebooks were the excuse the brick-and-mortar bookstores latched on to when they fell into decline starting in 2009 or so. Does the flat growth rate in ebooks mean that we’ll see a resurgence in B&M stores? Not necessarily the big-box chains, but maybe the local independent store. I think that ebooks made large publishers take a hard look at the traditional book distribution model, and they didn’t like what they saw. We might be at a point in the industry that a new distribution model will emerge, maybe a modified agency style model that removes some of the middlemen and flattens the playing field. I think you’re reacting a little too quickly here. A fair comparison between paper and e-books isn’t hostile to e-books, nor did the blog or any of the comments suggest that this is a one or the other situation. I’d agree with the above comment that recognized enlarged font as a very useful feature. As to your comment about bookmarks, you assume incorrectly. The fact of the matter is that one doesn’t always know at the time what might be important, relevant or interesting later on, and in such cases bookmarks are useless. I use the highlight/note function on my kindle often (though I find it very poor compared to writing in the margins). But try writing a paper using an e-book as a primary reference and see if you aren’t frustrated trying to hunt down random passages as they become needed. Flipping is simply much easier. You have an interesting crystal ball and some unique perspectives here but I would hesitate to jump to the conclusions you’ve made. The market may have flattened because the sizzle and pop of the new platform is now not quite as exciting, but as an avid tablet and smart phone user, I have moved exclusively for both my professional and personal reading to electronic titles in whatever format they come. And I am enthusiastic about the ability of the tablets and smart phones to make all reading formats come to life through extensions to online blogs, discussion forums, video, links, etc. What I’d like to see is for publishers to more fully embrace the media and use the possibilities within the platform. That I can annotate and bookmark within my Kindle app is a real snooze–I can do that in print too. But bringing the title to life via links, commentaries, discussions and other interactive bits brings opportunities for ebooks to be all that they can truly be. As a digital immigrant, it’s also my assumption that the digital natives behind us who are only using online textbooks in classrooms and universities will be mortified if told to use a hardback. As my elementary and middle-school aged children shared with me while shopping for “back-to-school” items recently, “I don’t need a backpack, mom. What would I put in there?” Truly, their online textbooks, with embedded video, audio text, interactive glossaries and indices require little more than a log in on a connected device, whether at home, in the classroom or out at the many places with public access in the community. The bigger question is will we even recognize the books of today in the future? Now that’s something for a lively discussion. One other factor, unmentioned, is that the publishers of ebooks have yet to engage in libraries in how to best deliver content in a way which makes economic sense for libraries and their patrons. While there are a couple of products out there for libraries, the cost is turning out to be extremely high on a per-book basis, so libraries have little incentive to develop ebooks as a content delivery mechanism for their patrons. It is as if publishers were charging $40 for a paperback to a library, because they are afraid so many people will use that book that the publisher will lose sales. Libraries are the places many people learn lifelong reading habits. To ignore those readers leaves ebook publishers with a self-inflicted disability. 1) Price. I routinely see prices of new paperbacks lower than the Kindle prices. This infuriates me, as I know the opportunity cost to sell another copy of the book digitally is near-zero. And once bought, I can’t loan it, can’t resell it, can’t give it away. I always, always, always buy a used paperback copy in these cases. 2) In the Apple ecosystem, it is so much harder to go from reading a book in the Kindle app to buying a book. On my kindle, in the Cloud Reader, or on my Android phone, moving from buying to reading is trivial. Frictionless. On my wife’s iPad, it’s an enormous pain to shop for Kindle titles. There are millions upon millions of iPad users who never get beyond Apple’s store because of it. I constantly run into people who think they have to buy the books from their computer, in order to read them in the Kindle app on their iPad. I think you may be onto something with the question of the ascendancy of tablets. I know when I had a Nook Simple, since I was limited to reading in B&W, and there were no machine distractions, I read voraciously. Fiction, of course, although I did adapt pdfs of owner’s manuals to my reader. Eventually, I was attracted to the color reader so that I could also subscribe to magazines. Now, I read both, including periodicals, however, with eBook prices almost as high as paper, I hesitate more than I used to when buying new eBooks. It’s also true that National Geographic can never look as good on my reader’s color screen as on my LCD HD Monitor. Neither can the NY Times. So, despite having originally purchased the reader for a NY Times eSubscription, I don’t read it there as much as I used to. My color reader also plays games, gets weather, etc., so I am more distracted when reading on it than I used to be on the simpler device. I think it is all just a settling out of a quickly cresting wave. We’ll all have to wait and see a while longer to see if the sea is going to rise or fall. I think the stats shown here are likely to be a little misleading. First of all, the AAP only represents the big publishers, so it seems likely that these numbers don’t include the quickly-growing numbers of self-published and independent ebooks that are being sold these days. The ebook best-seller lists every week include plenty of self-published work. Second, as emeraldcite says, market share growth is more telling than year-over-year percentage growth since a 1% increase in market share when you have a 1% share is 100% growth, but if you have a 25% share, that represents 4% growth. 7. The format causes us to sacrifice the convenience and weightiness of physical books, while giving us little in return. The design of eBook reader apps has been stuck in “Minimum Viable Product” mode for years, justified by the stratospheric rise in digital book sales. This has led to some confusion: the mass adoption of digital books does not imply that the reader software was well-designed to begin with. In this case I am speaking largely to the tablet-based reader software, namely Kindle and iBooks. But eBooks can be much smarter in subtler and more useful ways for readers. Technical books can have interactive code samples. DFW’s Infinite Jest can have a dictionary of its own terminology. The vocabulary and notes one picks up from reading can be much better organized. And yes, sometimes flashy interactivity is nice, when it’s thoughtfully designed, but as “liner notes” for the book, rather than a change to the internal format. And what about the potential for interactive book clubs with peer-to-peer connectivity? Nothing overboard or excessively “social,” just software designed for readers by readers, who tend to treat the activity as either private or close-knit. The Minimum Viable Product mentality extends from the software up to the business model. Regarding #4, for virtually the first time ever publishers can have real information on the ‘stickiness’ of their content, but they seem to do nothing about it. The software “knows” that you bought a book and let it collect virtual dust for six months. Why not suggest a trade for a more exciting title and keep people in the digital reading loop? Or, God forbid, a refund or credit for something you obviously hate (it’s easy to know — you read two chapters and put it down forever). Why does my eBook software never ask me if I hate a book? Or if I even have time or inclination to finish it? I think it’s silly to ignore the suppressive effect of DRM and format wars. When people discover that they have to think about what file format the book is being sold in to discover whether it can be read on the device they own, it slows down sales. A little over half the ebook titles my library offers for lending are not compatible with the reader I own. Some of the titles I can check out can’t be read on the readers that the library will let patrons check out. Lots of people held off on videotape until the VHS vs. Betamax wars ended. Before that, standardization on flat, round vinyl in three sizes helped the recorded music industry take off after years of wars between physically incompatible formats. Until all ebooks are sold in a format readable on any device and every device sold can read ebooks from any bookseller, a lot of users will hold off. There is an overwhelming amount of good content on the Internet in all forms – blogs, email news, videos. Nobody is manufacturing more time to go with e-readers so the time gets divided ever more and more. Meanwhile, my stacks of unread real books grows. I haven’t finished one in I don’t know how long. But I read more and more every day it seems. Some would argue the quality of read, but it is also true that more and more books are more and more filler to make a book. Most sales figures I have seen completely leave out book sales figures for book apps – the type of interactive books produced using the Adobe DPS and published by nontraditional publishers. These eBooks show that non-fiction works very well, indeed, in the eBook format as they contain information that can not be included in a print book. But the digital bookstores are a mess and are doing sales no favors at all. Apple promotes just a few titles, for instance, so sales are depressed and those with experience argue that book apps do better there than eBooks in the iBookstore. 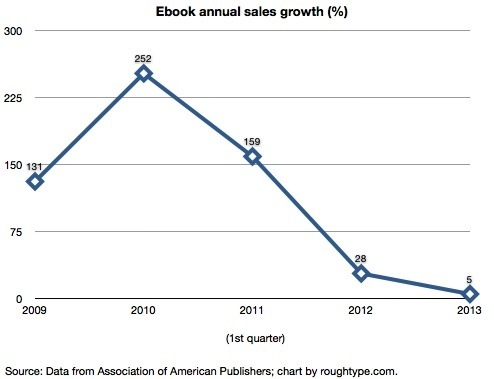 Books are undergoing the same sales arc that magazines saw. The initial excitement of an electronic version of a product fades pretty fast when it is discovered that the publisher put very little effort into the digital edition and all the reader gets is the equivalent of a PDF.